When financial services customers perceive that a firm does what is best for the customer, and not just what’s best for the firm, they feel more loyal and have a greater future purchase intent. This type of “customer advocacy” helps financial firms drive loyalty and can improve revenue. But how do you show customers you’re their best advocate? 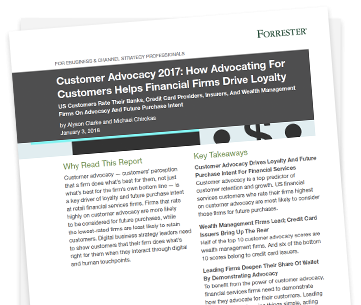 Download the Forrester report for these key insights that can help you improve customer advocacy.